Gold and silver prices ran out of momentum during the first week of July and have been drifting lower ever since. A deeper correction seems like a realistic expectation, but precious metals are showing strong signs of resiliency. Here are seven forces that should be creating headwinds for precious metals, but are barely having any impact. 1) Increased Margin Requirements – The CME raised margin requirements in the futures market for both gold and silver during July. Raising margins makes it more expensive for paper speculators to keep their positions. This type of increase in margin requirements often results in a sharp and sudden drop in the price. 2) Futures Expiration Approaching – The expiration of the futures contract is coming up on July 27 for gold and July 26 for silver. There is a fairly strong historic pattern of gold and silver prices dropping sharply just prior to expiration. Many believe paper manipulators use leverage, false bids and employ other tactics to send prices tumbling so that they can cover and profit from their short positions. 3) Bearish Commitment of Traders Report – The COT showed that speculative gold longs decreased their positions for the first time in more than a month, while shorts increased their own positions for the third week in a row. Short positions by commercial traders are near record levels and almost 2.5 times their long positions. We will get a better picture when COT data is released on Friday, but the expectation is that this trend continued throughout the most recent period. 4) Declining GLD Inventories Suggest Profit Taking – The GLD ETF has accelerated, especially by speculators and traders that have generated huge profits in the first half of the year. They do not have a bullish long-term view of the precious metals market or any philosophical reasons to be invested. They do not fear a crash in the stock market or dollar crash. They just bought the momentum and now that the momentum has slowed, they are likely cashing out. This is certainly evident in the declining GLD ETF inventories over the past few weeks. 5) Brexit Fears Fading Fast – Brexit dominated headlines following the unexpected ‘leave’ vote from the United Kingdom. Analysts were predicting gloom and doom, but financial armageddon never materialized. The decision for the UK to leave the EU helped to push the gold price higher in the short term, but investor concerns about the impact of Brexit and demand for safe haven following the vote have been muted. 6) Rising USD Index – The dollar is rising. In fact, the USD index has strengthened from 92.62 to 97.26 in the past two months. It is currently at 97.46. This is usually a bearish sign for gold and silver, but the inverse relationship can break during strong bull markets. 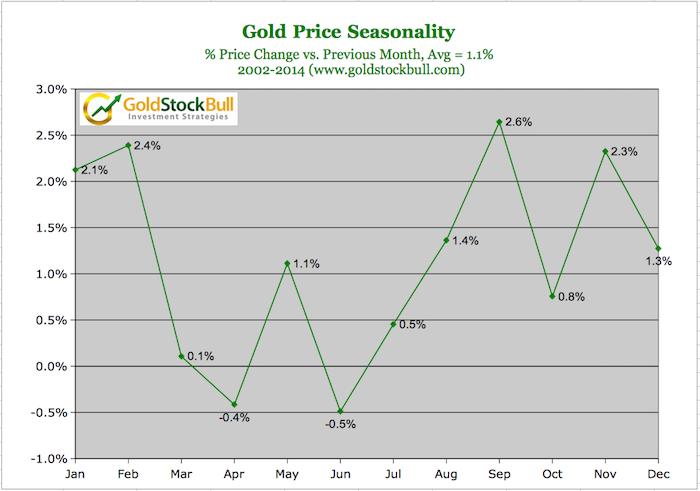 7) Weak Seasonal Months – June and July are typically two of the worst performing months for precious metals. In order, they are June, April, March and July. Despite all of this, the gold price is down just $55 (4%) from its 2016 high to $1,320. Silver is always more volatile, typically rising faster than gold and falling faster as well. The silver price is down $1.65 (7.7%) to $19.58, after its brief spike above $21 shortly after the July 4th fireworks. It is important to note that both metals remain above prior technical resistance levels that will ideally turn into support. Gold must hold above $1,305 and silver above $19.28. As long as they remain above these levels, our bullish outlook remains intact. The underlying signals of strength are even more potent for mining stocks. The mining stocks index has offered leverage of more than four times, advancing 110% vs. gold’s advance of 25%. Yet during the pullback of the past two weeks (gold -4% and silver -8%), the mining stocks index is down just 3%. Leverage to the upside and protection to the downside? I’ll take that risk/reward mix any day. It is entirely possible that gold and silver prices continue slipping in the days ahead, especially with futures expiration around the corner. But the mildness of the pullbacks witnessed thus far in 2016 are a testament to just how resilient gold has been. When the price corrects, buyers are stepping up to buy the dips aggressively, rather than panic out of their positions and hasten the slide. There is a certain conviction amongst gold investors, for the first time in nearly 5 years, that gold’s new bull cycle is just getting started. Despite all of the bearish short-term headwinds mentioned above, gold is benefiting from becoming very oversold and undervalued at the end of 2015. It is also benefiting from significantly reduced expectations of how fast and far the Federal Reserve will raise interest rates. Physical demand remains robust, both from central banks and investors. While Brexit didn’t lead to an immediate economic crisis, European banks remain highly leveraged and at risk of a collapse, geopolitical tensions remain high, terrorist attacks on Western targets are increasing, currency wars and escalating and Asian wealth is attempting to escape capital controls as China’s economy cools. Stock markets are flashing overbought signals from a variety of different data points, which increases demand for safe havens such as gold. Lastly, look for a contentious and unpredictable election season in the United States to be supportive of the gold price. ABN Amro recently suggested that a Trump presidency could push the gold price at least $500 higher. We are heading into the best performing season for precious metals and all of these above elements combined suggest that prices are likely to continue higher after the current pullback bottoms. While mining stocks have experienced an incredible run in 2016, they remain undervalued relative to the metals and should continue offering strong leverage for quite some time. Therefore, we believe that all dips should be used as buying opportunities. This is easier said than done, as most investors are too fearful to buy the dips and end up buying near tops. Instead, successful investors muster the fortitude to buy when everyone around them is selling and there is blood in the streets. This is the contrarian mindset that we employ at Gold Stock Bull and it has helped us build a portfolio of mining stocks that are up over 100% year to date. To view our top gold and silver stock picks, receive our trade alerts and get the top-rated contrarian newsletter, simply click here to sign up for a premium membership. Jason Hamlin is the founder of Gold Stock Bull and publishes a monthly contrarian newsletter that contains in-depth research into the markets with a focus on finding undervalued gold and silver mining companies. The Premium Membership includes the newsletter, real-time access to the model portfolio and email trade alerts whenever Jason is buying or selling. Click here for instant access!